"OK, Hollywood. Here we come." 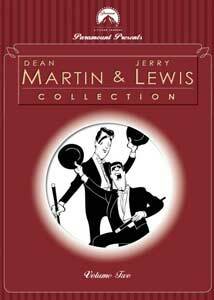 It had to be reassuring on some level, in the mid-1950s, to buy a ticket to a new Dean Martin/Jerry Lewis movie—you could be certain that you would be getting more of the same, stupid comedies in which Jerry acts wacky and Dean sings and gets the girl, the cinematic equivalent of comfort food. And as this is Volume 2 of their oeuvre, you can sort of count on the same experience at home with your DVD player. You'd be insane to look for high art here, and if you don't set your expectations low, you're likely to get restless—at times you sense that even Jerry and Dean are bored with the formula, and have at least one eye on the leggy extras or the P.A. with the cocktail shaker, or are busy nurturing their resentments against one another. But it can be worth it to go in willfully ignorant and revel in the stupidity, because goodness knows, here it's not in short supply. Their onscreen personae are already firmly locked in place in Pardners, from 1956—on some level, it's sort of reassuring to see them do exactly the same schtick, to know that they're as reliable as were Laurel and Hardy, or Abbott and Costello. But there's no denying that Lewis's borderline-retarded stock character doesn't wear well over an extended period of time; and you can't help but read the duo's history into a movie like this and wonder if Dino hasn't already had his fill of getting upstaged by the little guy. As you might surmise from the title, this one's a Western parody—it opens with Lewis as Wade and Martin as Slim, a couple of standup cowboys who go down in a blaze of glory, Butch and Sundance style. Each has an infant son, and the movie quickly catapults ahead 25 years—now Slim is a proper cowboy, while Wade is a pampered, fey, spoiled, rich mama's boy. Martin of course is a singin' cowboy, and the songs here are by the reliable tandem of Sammy Cahn and James Van Heusen; the plot is necessarily silly, in which Slim needs a few extra dollars to save the ranch and have Cuddles the bull inseminate his barn full of cows. Director Norman Taurog wrings some laughs from the sendup of Westerns—Lewis's Wade becomes the improbable patsy of a town sheriff—but it never ever feels quite funny enough. It is notable for a few of the names in the credits, though—the screenplay is by Sidney Sheldon, before he dreamed of Jeannie, and as Jerry's battle axe of a mother is Agnes Moorhead, somewhere on the decline from Charles Foster Kane's mother to all those many years as Endora. The nightcap of the Disc One double feature is Hollywood or Bust, from the same year—it's a road picture, essentially, but more than anything else, it earns your respect for Lewis's unwavering commitment to the stupid. It's almost like he's less interested in punchlines than he is in the total physical effort of being silly and ridiculous; and a little goes a long way. Anyway, he plays Malcolm, who goes to the movies every night, memorizes the credits, and spins out elaborate fantasies about cavorting with Hollywood starlets—his local theater is giving away a sweet, cherry-red convertible with huge fins, and since each ticket stub is an entry in the lottery, Malcolm figures that he's got a better chance than anyone. Looking to rig the drawing is Steve (Martin), a low-level goodfella who needs a new set of wheels—he forges a winning ticket, and since there's just one car, the two are forced to split the baby. They hit the road together for Hollywood, with Malcolm's titanic Great Dane in tow. What may be most interesting about this one is its overt expression of the anxiety of the film studios about the coming omnipresence of television—the whole thing is kind of an advertisement for getting out of the house and going to the movies, so the irony of watching it at home on DVD is pretty thick. It's also full of love for Hollywood landmarks long gone, like the Brown Derby and Romanoffs, and for some that still stand—the film's climactic moments happen at the Hollywood Bowl. There are lots and lots of matte shots, and images of the boys at places like the Grand Canyon and the Hoover Dam; the requisite stop in Vegas; and the high life once they make it to California. (Swimming pools. Movie stars.) And of course there are lots of pretty girls along the way, for Dean to hit on and Jerry to strike out with; but mostly it's a movie which loves jokes like the image of a dog driving a car. Also, the credited screenwriter is Erna Lazarus, so if you squint or don't quite pay attention while watching the credits, you shouldn't expect Dean and Jerry to get wacky with her huddled masses yearning to breathe free. Now, if you scrunch your face up, and look at Jerry Lewis from just the right angle, doesn't he kind of, sort of bear a passing resemblance to Carole Lombard? No, I don't think so either. Still, it was kind of an inspired idea to remake Nothing Sacred with Lewis in for Lombard, and the result is Living It Up, which flies solo on the second disc of this set. Jerry plays Homer, who lives in rural New Mexico and is working for the railroad, all the livelong day—wires get crossed, and he gets mistakenly diagnosed with radiation poisoning, leaving the small-town boy with the notion that he's only got days to live, the poor soul. Those wires quickly get uncrossed, however, but not before Homer becomes the darling of the New York City tabloids—he's hitched a ride to the big city, and the cosmopolitan New Yorkers are falling all over themselves to be kind to the poor dumb sap from the sticks whose life, they figure, is measured not by the calendar, but the clock. A part needed to be beefed up for Dean, so he's along for the ride as Jerry's personal physician, though he seems like the kind of doctor more skilled at his short game or chasing his nurses around the diagnosis table than in actually practicing medicine. The principal object of his advances here is Janet Leigh, as the reporter clutching to her exclusives with Homer—the occasional pinch from the doc is the price she has to pay for that much ink above the fold. That kind of snorting sexism aside, what's most winning about the movie is its starry-eyed view of New York, as perpetually fun, clean, and inviting. It's also another instance of Lewis's reckless comic abandon, in a series of gags that pay homage to Buster Keaton, among others. The film kind of runs out of comic ideas at some point, though, and we're reduced to watching Lewis goofing in a jitterbug contest, and we get lots of basset hound reaction shots. Also, Leigh's editor's name is Oliver Stone, making one suspect that perhaps it was Jerry and Dean who were on the grassy knoll. Chronology clearly wasn't a priority in assembling this set—the two movies on the first disc are from 1956, the one on the second is from 1954, and the third kicks off with a film from 1955, called You're Never Too Young, which could be Lewis's motto. (Or, you're only young once, but you can be immature for a lifetime!) Here Jerry plays Wilbur, who has dreams of tonsorial glory, of serving as the barber to the stars—for now he's got to content himself with sweeping up the clippings in a hotel salon. Dean plays a teacher at a girls' prep school, inviting all sorts of Humbert Humbert comparisons even though he's got a love interest on the faculty, but things really get smoking (as they always do) when Raymond Burr shows up. The villain of the piece, he heists a huge diamond from a guest at the hotel, first planting it on Dean, and then on Jerry—he fails to get it back, though, and has to chase Jerry up the west coast, to Washington. Poor Jerry is short a few dollars for his train ticket, so he masquerades as a little kid, to qualify for a half-price fare—hijinks ensue, including Dean's girlfriend taking the little tyke into her sleeper cabin for the evening. Sure enough, the action spills over onto campus, where Dean is the object of many schoolgirl crushes, and the wonderful Nina Foch is a devious and jealous one—if her love for Dean will continue to go unrequited, she must crush the object of his affection. The whole thing has a meandering quality to it, and the movie frequently loses sight of the story—you kind of expect to be getting that with these pictures, though, and this one doesn't disappoint. It's sort of a jolly little study in stupidity, but it doesn't have the outrageous belly laughs you might have hoped for. In a sense the set has saved the best for last, though you've still got to question the judgment of the critic who, in the most recent Sight and Sound poll, put Artists and Models on the roster of top ten films of all time. That might be because this is the most substantive of the movies—Dean plays Rick, who has ideas about being the next Jackson Pollock but makes rent by painting billboards, and Jerry is Eugene, whose notions of following in Hemingway's footsteps are easily nosed out by the latest installment of his beloved Bat Lady comic books. Through nothing more than sheer dumb luck, the two have the opportunity to trade in high art for low, and collaborate on a comic book, a project to which they're both surprisingly well suited. Their editor wants their output to be as violent as possible, because the kids love that stuff, and the movie tiptoes into the debate over whether comic-book violence really does inspire its consumers to move on to the real thing. (Substitute movies or television or video games, and the discussion in our time hasn't changed much.) And it's easy to imagine Michael Chabon, the author of The Amazing Adventures of Kavalier & Clay, having a weakness for this one. But it's typically schematic, with a few highlights, chiefly the appearance of Shirley MacLaine—she's the secretary and gatekeeper for Dean and Jerry's editor, and as a doofus is almost a rival for Jerry's stupidity. Naturally, she's his love interest, and at times, with its mixture of office politics and workplace romance with a somewhat smutty bent, can be seen as a dress rehearsal for her work in The Apartment. Image Transfer Review: Five features, all in VistaVision! Actually, it's impressive how well mounted these productions are—you've got to believe that these could have been made on the cheap, and that the target audience wouldn't have minded. Transfers are adequate, if occasionally faded and blotchy. Audio Transfer Review: I have refrained thus far from making any Jerry-Lewis-genius-to-the-French jokes in this review, but will merely note that the French mono track is about as clean as the English one—limited, but adequate. Extras Review: The five movies are on three discs, and are bereft of extras, but for the Hirschfeld cartoon that graces the front and back cover of the sleeve. Five more times around the block with Dino and Jerry—as has been said before, this is the sort of thing you'll like, if you like this sort of thing. Hey, laaaaaaady!!! !